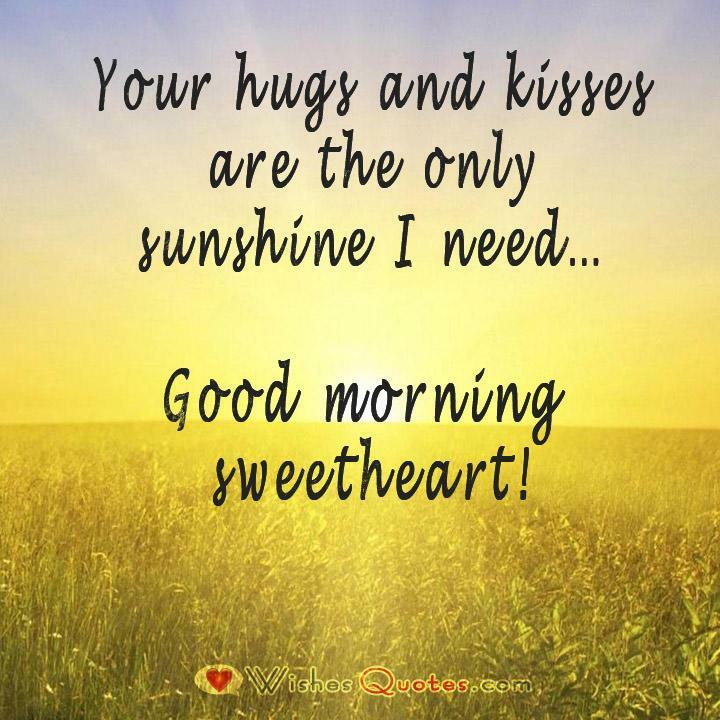 Browse our wonderful collection of good morning quotes and messages for your girlfriend or wife and spark your own imagination for personal morning love messages to your sweetie. We all enjoy waking up with a smile; things just seem to go better all day. For your special lady, girlfriend, fiance, or wife, we wish every day would be one of those great days. Certainly things may occur during the next 24 hours that steal their smile. However, we have the ability to start their day with a small spark in their “smile bank” to use later in the day. It can be as small as a note on their pillow or a text waiting in their “in” box, and we should do these things with no expectation of getting something in return. This small expression of love and appreciation has no price tag, yet can provide her with a day-long feeling of inner peace and contentment. Here are just a few examples to start her day with a smile in her heart. When I woke up this morning, you were sleeping so soundly that I didn’t want to wake you to tell you how truly beautiful you are. Your hugs and kisses are the only sunshine I need… Good morning sweetheart! Good Morning Sweetie. Look in your purse; I put your favorite chocolate in there so when you have a snack, you’ll remember who’s sweet on you. I don’t think I took the time to tell you how great your dinner was last night. I don’t know how you manage to do it all so well. How lucky am I? I get to spend another day loving you. Let’s talk about that later (wink, wink). You are always a part of my bedtime prayers of gratitude, honey. Thinking about you this morning, I thanked God again. I’m not the brightest guy in the world, but I’m so grateful for dumb luck! I get to spend my life with you. My Dad used to annoy us so badly, snoring like a LumberKack. How come your snoring is so cute, LumberJill? Hey babe! Have a great day, and remember… those trolls at work are just jealous of your intellect and beauty. Knock ’em dead! Just a “heads up.” When I see you on Saturday, I’ll be carrying a bottle of wine and wearing only a smile. Love you! I don’t know how you do it all, Sweetie: work, kids, ME! Yet you get up each day and do it all again with a smile. To my amazing girlfriend: How about we put off saving our money for just one day and go out for dinner tonight? Roses are red, so is rose’. Let’s have some tonight and another roll in the hay. (Last night was great, babe). Sometimes when I wake up next to you, I wonder what I ever did to deserve you. I look forward to that each morning, honey. Because of you, my bad days turn around. Because of you, my feet are on the ground. Because of you, the change in my life is profound. Thanks. Good morning, my love, and thank you for another wonderful weekend. You always give so much and I want you to know I’m grateful. My friends have told me they think you’re beautiful. I told them that your real beauty is on the inside. I love you. I know that when you wake up, your day is going to be crazy — just remember how powerful and beautiful you are to me, Sweetie. I have to apologize for not waking up singing “Zippety Do Dah” in the morning, but when the fog clears; I do smile thinking of you. When times were rough, I wish I could have seen this life in a crystal ball. I never would have believed how much you mean to me. Good Morning! I’m thinking about what a great date we had and hoping that your charitable mood will extend to include this weekend also. By the time you receive this message, you will have seen the flowers I left for you. They pale in comparison to your beauty. I always knew you were beautiful, but waking up beside you, it’s almost breathtaking! Good Morning, Honey. Life is so crazy, it’s nice to know I get to start and end my day with my one and only love. If you feel the way I feel this morning, we’ll be seeing eachother alot. I had a great time — Thank you!